Diese Unterkunft wird von Stewart Mountain Lodging angeboten und bietet Zugang zu anderen Annehmlichkeiten und vielen weiteren Hotels in der Nähe. Nehmen wir als Erstes an, es gibt keinen besseren Ort im Sundance-Gebiet als direkt am Gebirgsbach. Und wir meinen, Sie können buchstäblich bequem im Wohnzimmer sitzen und die Aussicht auf den Bach direkt vor den großen Fenstern genießen. Der andere Maßstab dieser perfekten Umgebung ist die Privatsphäre. Ganz am Ende der Big Pine Road gelegen, bietet dieses Berghaus den ultimativen privaten Rückzugsort. Keine Autos, kein Lärm (außer natürlich der Soundtrack des Gebirgsbaches). Diese Eigenschaft ist sauber, gemütlich und neu renoviert. Es verfügt über eine voll ausgestattete Küche mit Edelstahlgeräten und einen Esstisch, an dem bequem sechs Personen Platz finden. Das Hauptwohnzimmer umfasst schöne neue Ledersofas vor einem echten Holzkamin. Lassen Sie Stewart Mountain Lodging Ihren Urlaub in den Bergen aufnehmen! Wir leben hier in Sundance Vollzeit - also sind wir immer erreichbar. Sie werden unseren privaten Park "The Hollow" mit Außenkamin und Zip Line Swing lieben. Mit unserem umfassenden Concierge-Service können wir einen Tag Fliegenfischen mit unseren Lieblingsführern arrangieren, verschiedene Tagesausflüge und / oder Wanderungen in der Umgebung empfehlen oder eine Massage bei Ihnen zu Hause arrangieren. Sie lieben die persönliche Note und die herzliche Gastfreundschaft Ihrer Bergwirte. Wir würden diesen magischen Ort gerne mit Ihnen teilen. Wir alle von Stewart Mountain Lodging freuen uns auf Ihren Gastgeber. The stream was wonderful. We used the park and loved it! I was disappointed in the cabin. There were areas that needed repair like the cabinet under the sink. The cabin was outdated and there were cobwebs in several places. We enjoyed our stay and would recommend this area. The staff was awesome, so helpful, and friendly. The house and the grounds exceeded my expectations. AWESOME! We really enjoyed our time at La Cabana, especially the creekside patio to enjoy a beautiful summer weekend with friends. This cabin was perfectly located and we felt right at home! The river was incredible! Door was locked upon our arrival, not open and all lit up and awaiting our arrival, as was stated. Carpets and master bedroom comforter are in need of replacement. Could not walk to sundance resort for dinner in evening because there were no street lights. Views out the floor to ceiling windows were beautiful. Soothing rushing stream. Thanks for the feedback Lori. We are happy to hear you enjoyed the weekend and location of the cabin. The setting on the stream is the absolute best feature of this cabin and we love watching the stream year round from the porch and inside out the large windows. Unfortunately you did make it to the cabin before we were able to get it open and staged for you. Thank you for calling upon arrival and we were happy to have Carol there within 5 minutes of your call to get you in and show you around the cabin. No, there are no street lights in our mountains - we think that would definitely detract from the natural setting of being in the forest. We love our dark nights that showcase the stars so well. We leave flashlights in all our properties and there was one on your master bedroom night stand for such an outing. We will definitely have the carpets cleaned but they were replaced 3 years ago and will look at buying a new comforter. Thanks again and I hope you come back this way to visit again soon. Thank you for the review Sandra and we are sorry your daughter got scratched. We couldn't agree more with your list of reasons to stay at La Cabana as well as the tricky ladder to access the loft and second bedroom. 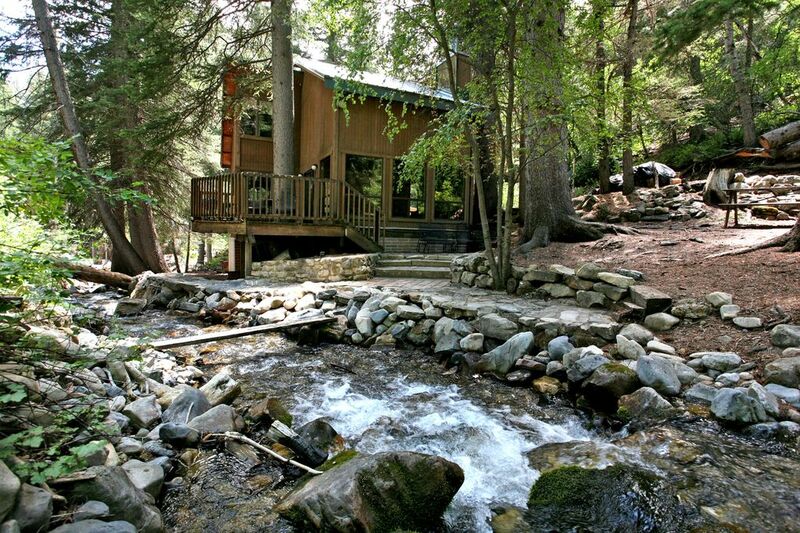 It isn't a cabin for everyone but for those that have stayed on a stream before know why they'd book again. Kids love lofts, we can't blame them but they need to know what they are doing and make sure they are safe up there. We recommend everyone comes down the ladder from the loft the same way they went up - facing the stairs. We hope we can get you back again in the future. Enjoy the rest of the summer! Das Sundance Resort liegt etwa 8 Gehminuten von dieser Hütte entfernt. Es bietet gehobene Küche und eine Vielzahl von kulturellen, künstlerischen und Naturprogrammen. Genießen Sie herrliche Wanderwege und eine lange Liste anderer Aktivitäten in und um Sundance. Diese Unterkunft, die von Stewart Mountain Lodging angeboten wird, bietet Zugang zu anderen Annehmlichkeiten und Hotels in der Nähe. Sie werden unsere Zip Line Swing und Fire Pit lieben, ganz zu schweigen von der persönlichen Gastfreundschaft und den liebenswürdigen Gästeservices Ihrer Gastgeber. Wir würden uns freuen, diesen schönen Ort mit Ihnen zu teilen.